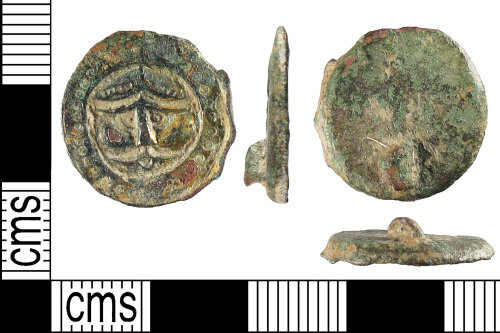 An incomplete Early-Medieval (Anglo-Saxon) copper-alloy and gilded button brooch (c. 450 - c. 550). The pin, pin mechanism and most of the rim are missing. This brooch is sub-circular in plan and the surviving part of the rim (about 20%) is upturned and flares outwards at an angle of about 45°. The upper surface of the brooch is decorated with a central chip-carved anthropomorphic forward facing mask, within a raised circular border. The 'helmet' (or possibly hair) is formed of a curved line with a circle in the middle. The eyebrows and nose are formed of a single element and the nose is a sub-triangular shape. Both eyes are sub-triangular. The horizontal mouth is formed from two pointed-ovals. The rear of the brooch is flat with a curved periphery. On the rear there is the remains of a small lug. All the decorative features are well defined. This brooch has traces of gilding on the front. The surface at the rear is uneven and has green patina. The brooch measures 17.5mm diameter 2.7mm thick with rim, 1.2mm thick without. The remaining lug and brooch is 4.1mm thick. The brooch weighs 2.49 grams. This example is a Suzuki Class A1 (Suzuki 2008: 145-152, plates 1-30). Suzuki, S. 2008. Anglo-Saxon Button Brooches. Typology, Genealogy, Chronolgy. Woodbridge: The Boydell Press.